SCWC (KM) lists this as a year 2000 issue, but I suspect in should be 1999 as seen on the obverse. Naturally, it's celebrating the Millennium with various symbols including a prominent Y2K, a big scare for all computers which never materialized. 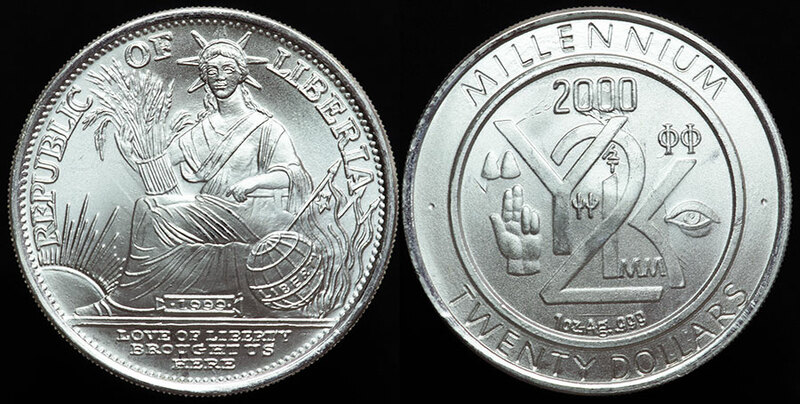 The seated Liberty design was used in a series of coins from Liberia, not too well rendered in my opinion. These are not so common with only 2000 struck and they're an even ounce of pure silver.